Notes: I received an eARC loan from the publisher in exchange for an honest review. Quotes need to be checked against the final version as they are subject to change. At first glance, Nahir appears to be an average girl. Take a second glance, and you will probably notice her eyes--they're unnaturally black. If you take the time to take a closer look, however, and really see her, you'll notice there is nothing average or ordinary about her. "That's very arrogant of you, Nahri. Blasphemous, even," he added, looking taken aback. "Only a fool would speak in such a way." A while ago I wished someone would write a genie tale that was not a remake of Aladdin, but something truly their own, original and new. Around that same time I also wished more authors would create their own original "fairy tale" type stories like Naomi Novik did with her story 'Uprooted'. 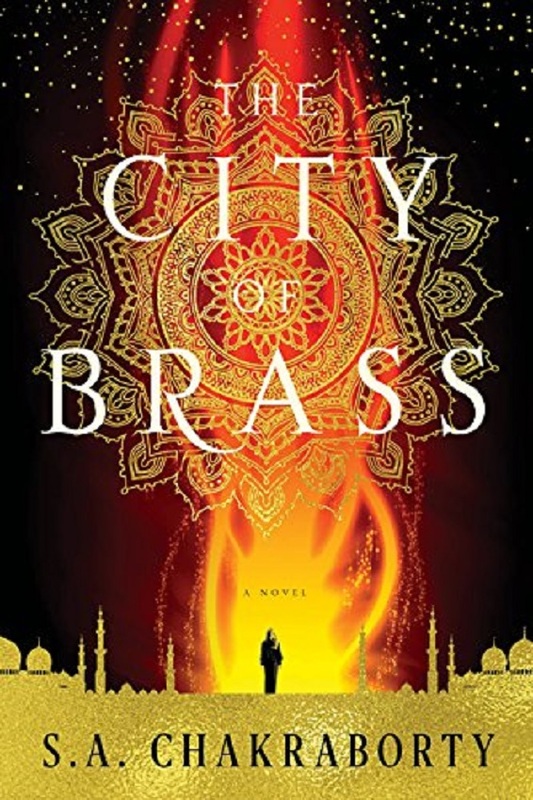 Well, my wishes have been granted by at least one author--S. A. Chakraboty's 'The City of Brass' just knocked my socks off. Call me enchanted. Nahir is smart, curious, and strong. She'll make the best of whatever situation she's in. She doesn't trust easily, but when she does she's quite loyal to her friends. What complicates her predicament is that right around the time she was born a change of power happened, and not all the residents of Daevabad are happy about it to this day. Nahir is about to walk right into that world and end up smack dab in the center of a power struggle which is never a good place to be. Prince Alizayd 'Ali' al Qahtani is the second son of the current king of Daevabed. The chapters of the book toggle between Nahir's and his viewpoint. Ali is the result of a political marriage intended to forge an alliance between two of the daeva tribes. Ali doesn't agree with many of his father's practices and his treatment of the shafit is a big one. Ali sympathizes with these underdogs of the daeva world and has been secretly trying to help them. Something which could get him into deep trouble. I couldn't help but give this one 5 out of 5 roses. The series holds great promise and I'm looking forward to finding out where the author takes Nahir, Ali, and us next. I loved Nahir and how she has to try to figure out what is truth and what is lie. She walks a fine perilous line where one wrong move could be her last. While there is a lot going on and much is revealed, there is so much we and Nahir still have to learn about Nahir's family, her power, and the daeva world she now finds herself a part of. Tensions run high and there seems to be twists and turns around every corner. I have a feeling Ali and Nahir together will stir things up in Daevabed which is nicknamed The City of Brass due to the brass walls that protect it. I, for one, can't wait. A wonderful debut that I HIGHLY recommend.